In some instances before trying out a new restaurant that's a bit of a drive from our home base in Danbury, I do some recon. 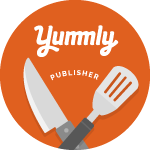 You know, the usual, read some reviews by blogger buddies and check out sites like Urbanspoon and Yelp. I like to get a general idea of what to expect. Well, after a fun Twitter exchange with the social media person at Estia's American in Darien, we decided to do some recon and go check it out. It sounded like our type of spot serving fresh, locally sourced ingredients on an eclectic American/Southwest-inspired menu. I had high expectations. The owner is longtime restaurateur Colin Ambrose, who is known for being farm-to-table before it was trendy. He's best known for his restaurant Estia's Little Kitchen in Sag Harbor which has its own on-site garden. After looking at the menu, most items just didn't feel particularly seasonal. I think my expectations were greater than what might be feasible or simply greater than what they do at this time of year. And, there was one small thing, that is kind of silly, but did irk me a bit. The pumpkin cheesecake (which was delicious) was garnished with fresh raspberries. Seeing fresh raspberries on a plate in winter in New England at an establishment known for local sourcing, just gets my knickers in a twist. Is that nick-picky? Yes, for sure. But, to me, it just flies in the face of the philosophy of farm-to-table. Okay, mini-rant over. So, let's start at the beginning. 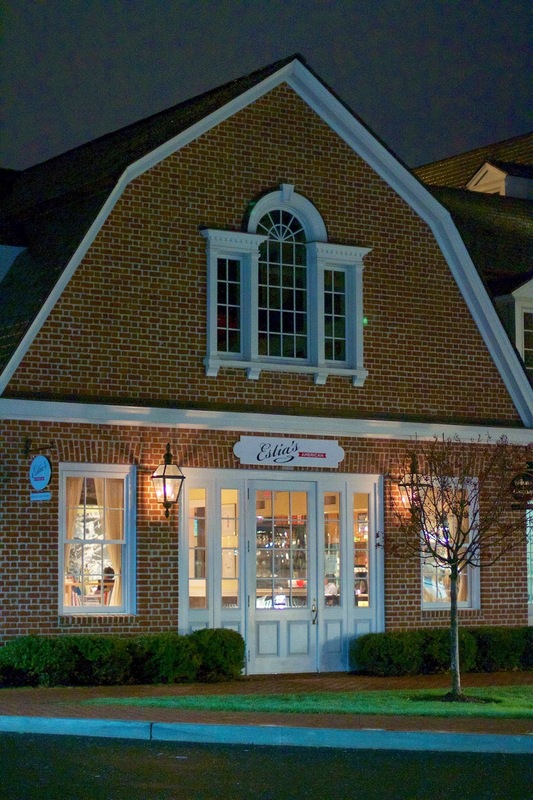 Estia's American is tucked away just off the Post Road in Darien on Brick Walkway. It's a quaint spot, with only 45 seats. Decorated with rustic touches of Americana, books, and original artwork, the space offers a warm, friendly atmosphere. We arrived for an early dinner, but the restaurant quickly filled up. The beer selection is very limited; the focus is much more on the wine list and some specialty cocktails. 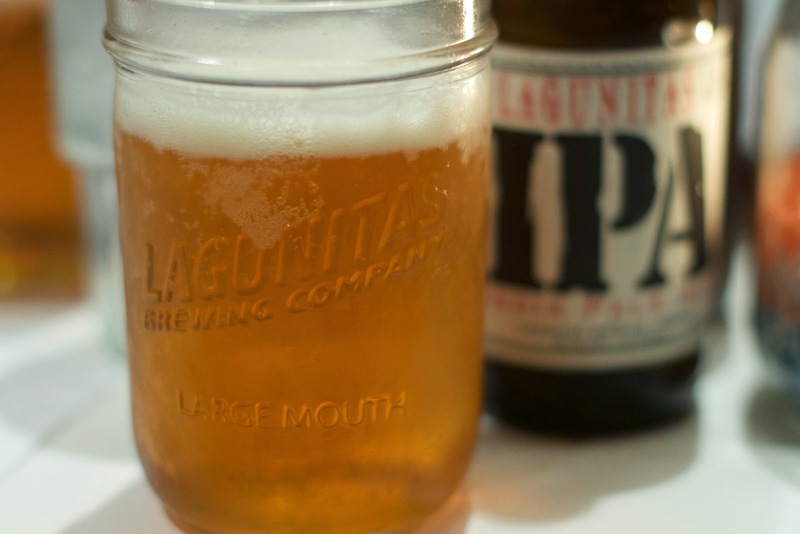 I was tempted to have a cocktail, but instead opted for a Lagunitas IPA. Seemed like a good match for Southwestern fare. We started with two appetizers. 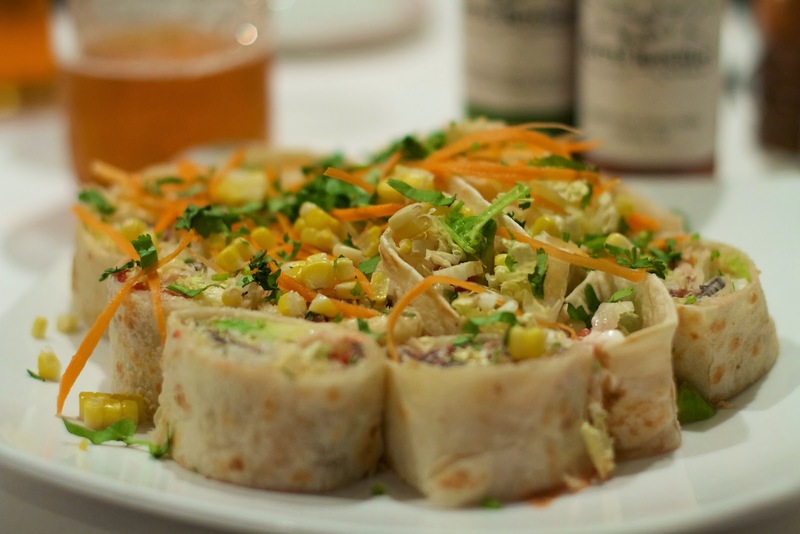 Renato ordered the Turtle Rolls featuring avocados, onions, black bean puree, Napa cabbage, corn, cheese and sour cream wrapped in a flour tortilla. The serving size was very generous. The vegetables were very crisp; the cabbage had an especially good crunch. We both enjoyed it. 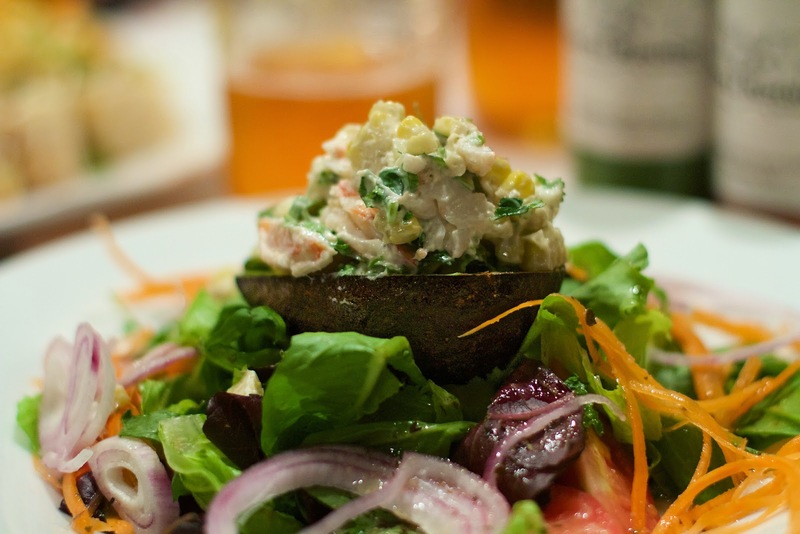 I chose the Avocado Rellena featuring shrimp, fresh corn and tomato in a fresh cilantro-lime dressing. There was plenty of shrimp for every bite and I loved the red onion slices. I'm not a big fan of mayo, so for me, there was a bit too much mayo. For dinner, I ordered the Grilled Fish Tacos with tequila sunrise salsa. It was very fresh and clean tasting, but was a little plain. The salsa was very mild. I thought there would be a bit more heat to it, but not everyone is as addicted to spicy as I am. Mondays are burger nights at Estia's American so Renato went with the Short-rib Stuffed Cheeseburger. He enjoyed it but said it was a bit dry. The bread was a little crunchy yet soft and didn't fall apart. 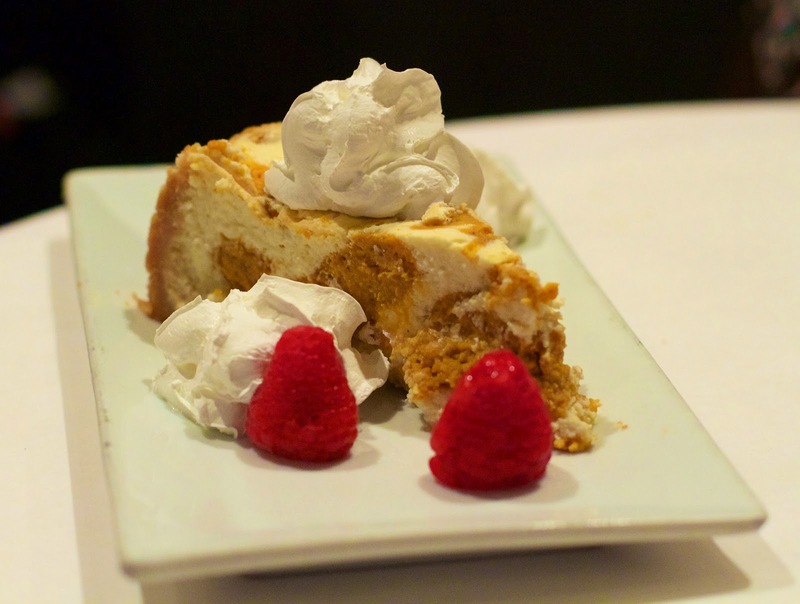 To round out our evening, we decided to share a slice of Pumpkin Cheesecake. Other than my pet peeve about the fresh raspberry garnish, we enjoyed it. It was light and creamy. Overall, the meal was OK. The flavors were very middle-of-the-road. We didn't get any of those bites, you know, the kind that take your taste buds on a whirlwind journey. It was good, but not great. It didn't wow us. In reading the online reviews, when we did our pre-visit recon, we expected a lot. Maybe it was an off night or maybe our expectations were too high. It was a nice Monday night out, but I might hesitate trekking from Danbury to Darien to go again. Have you been Estia's American? What did you order? Did you enjoy it? Every night between 5 and 6:30 pm, there’s a $28 prix fixe that includes a soup or salad, entrée, and dessert. 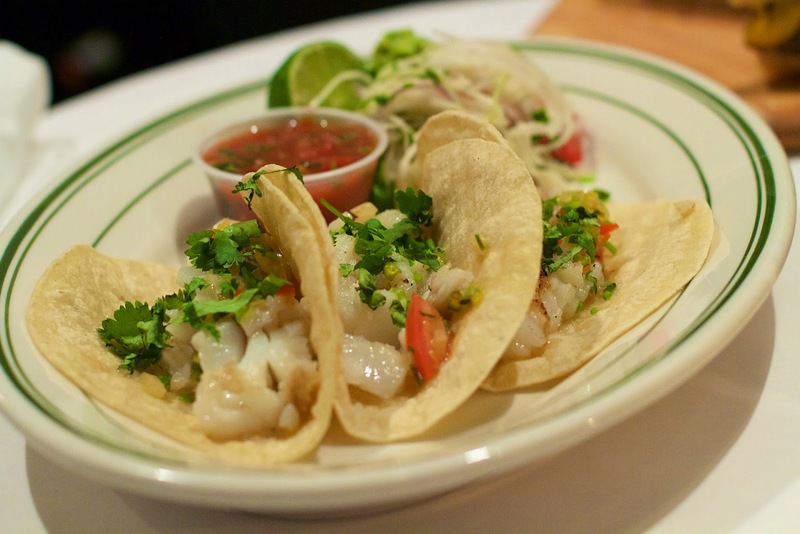 Taco Tuesdays - Tacos with Fish, Lobster, Duck, Turkey and Short-rib, served with salad for $10; pitchers of margaritas are $20. 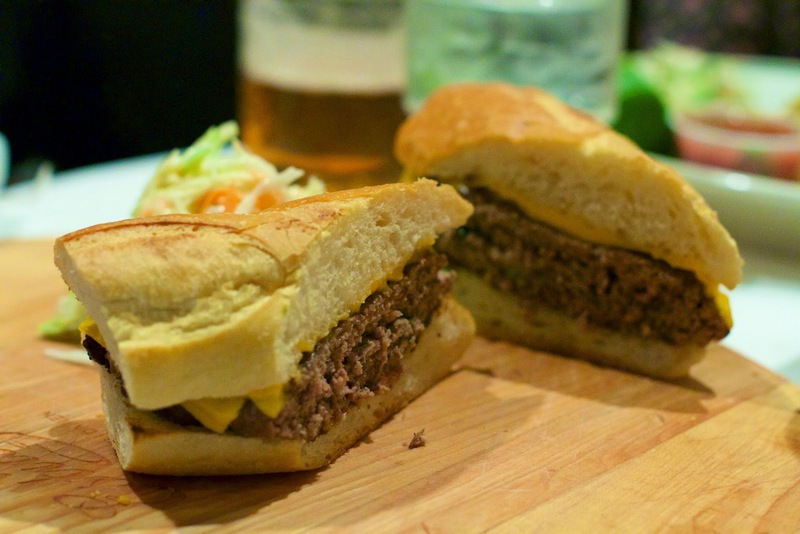 Monday Burger Nights - Veggie, Turkey, or Short-rib stuffed cheeseburger for $10 with special wines at $20 a bottle.